It is a quantifiable, objective way for a compensation committee to gauge how an executive is positioned versus the market, and helps the committee to understand what competitive pay is and if compensation arrangements are adequate to attract, retain and appropriately motivate executives. When proxy season ends, many companies will review market benchmark pay data in the next few months. When used appropriately, market benchmark data provides a valuable tool to help make informed pay decisions, but should not be used without appropriate context. Consideration must be given to other individual and company-specific factors in evaluating where the executive should fall relative to the benchmark. 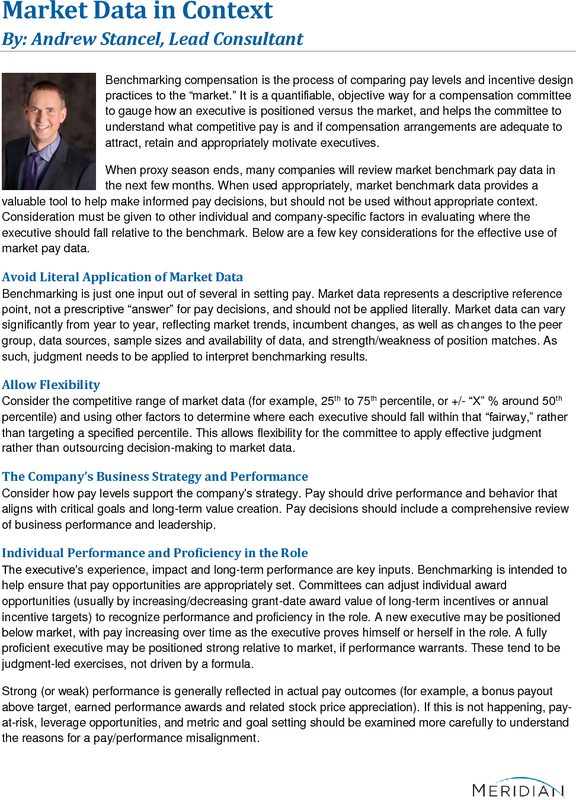 Below are a few key considerations for the effective use of market pay data. Benchmarking is just one input out of several in setting pay. Market data represents a descriptive reference point, not a prescriptive “answer” for pay decisions, and should not be applied literally. Market data can vary significantly from year to year, reflecting market trends, incumbent changes, as well as changes to the peer group, data sources, sample sizes and availability of data, and strength/weakness of position matches. As such, judgment needs to be applied to interpret benchmarking results. Consider the competitive range of market data (for example, 25th to 75th percentile, or +/- “X” % around 50th percentile) and using other factors to determine where each executive should fall within that “fairway,” rather than targeting a specified percentile. This allows flexibility for the committee to apply effective judgment rather than outsourcing decision-making to market data. Consider how pay levels support the company’s strategy. Pay should drive performance and behavior that aligns with critical goals and long-term value creation. Pay decisions should include a comprehensive review of business performance and leadership. The executive’s experience, impact and long-term performance are key inputs. Benchmarking is intended to help ensure that pay opportunities are appropriately set. Committees can adjust individual award opportunities (usually by increasing/decreasing grant-date award value of long-term incentives or annual incentive targets) to recognize performance and proficiency in the role. A new executive may be positioned below market, with pay increasing over time as the executive proves himself or herself in the role. A fully proficient executive may be positioned strong relative to market, if performance warrants. These tend to be judgment-led exercises, not driven by a formula. Strong (or weak) performance is generally reflected in actual pay outcomes (for example, a bonus payout above target, earned performance awards and related stock price appreciation). If this is not happening, pay-at-risk, leverage opportunities, and metric and goal setting should be examined more carefully to understand the reasons for a pay/performance misalignment. Differences in scope, tenure of incumbent and internal equity are important. While all executives at a certain level (e.g., EVP) might receive similar pay, particularly in terms of their incentive compensation opportunities, there may be differences between the role in the company and the typical external benchmark, or in the relative value and succession potential of the individual vs. internal peers. Using an egalitarian structure across all executive as a certain level may be challenging when the committee wants to have sustained strong alignment with market pay opportunities for the individual roles. Pay opportunities may need to be modified to allow greater discretion to position some executive roles closer to individual market values, i.e., to balance internal equity and competitive market considerations. Pay decisions may adjust to ensure that key employees remain with the company. 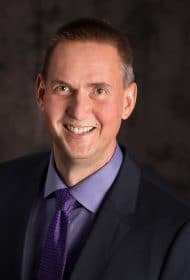 Although compensation is only one component when an executive deliberates on whether to stay or go, it is an important factor and one that is easy to measure. Sometimes, special off-cycle equity grants are appropriate for key retention risks, beyond traditional positioning against market objectives. Committees should consider all of these factors as part of the compensation governance processes that helps the committee fulfill duties of evaluating and governing executive pay.